1. Is ECURRENCY TAM website is SECURED? Ans: Yes, Domain & Hosted at Godaddy with Standrad SSL & EV SSL enabled website . It show Green Bar in URL https://. Your sensitive data like Email, Phone Number, Bank Details etc.. are fully secured. 2. Is ECURRENCY TEAM website is legitimate? 3. How can I trust your website? 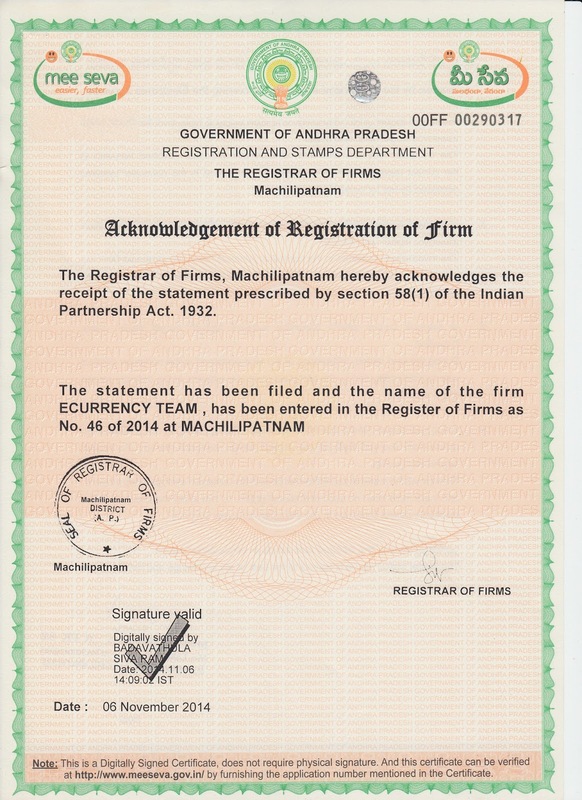 Ans: Check our Registration Certificate, Check our contact details in http://ceoandhra.nic.in/home.aspx & yo can also find it in google business lisitng by typing in google search as "ECURRENCY TEAM". 6. Is this site is automated & Can i get automated reply? Ans: No, our site is semi-automated. Once the Order placed you will get system generated ORDER number & also you will get your submitted order information to your email along with Order Number. 7. Can I track my order details? Ans: Yes, you can Track Your Order details based on your Order Type | Order Number | Email ID (whichever mentioned at the time of order submitted). We will maintain your Order database track record up to 180 days from the date of order submitted. 8. What about the Track Order Status? Ans: After Order Submitted, your order status shows as PENDING. Once the order status completed, we will update TRANSACTION DETAILS and it shows COMPLETED. 9. Do you need any Identity & Address Proof Details? Ans: Yes, we need Identity & Address Proof of the Customers, Who want to buy, sell or Exchange Ecurrencies. To avoid fraudulent ecurrency transactions. 10. Where can I submit my Identity & Address Proof Details? 11. What is the Minumum & Maximum Transaction Limits? 12. Are you provide any System/Laptop/Internet/wifi/data service for cash deal transactions? Ans: We don't provide any type of services (System/Laptop/Internet/wifi/data service) for transactions. You can carry your own Equipments to do transactions. 13. Is there any Face to Face Cash Deals? Ans: Yes, Above 2000$ Buy or Sell Cash Transaction deals available in Machilipatnam, Hyderabad, Vijaywada, Tirupati & Chennai. Our KYC Norms applicable as per our Terms and Conditions. 14. How much time will to process payments? Ans: Normally, All Payments processed in 30 Minutes to 4 Hours. But First Time Transaction take 4 Hours to 24 Hours based on the bank information provided by you. 15. Can I get Rates & Fund Availability via Email Alert?